Pasta dishes are a meal staple for many people, and some choose to enjoy creamy, cheese-laden fettuccine Alfredo. The pasta used for this dish, fettuccine, is similar to spaghetti, but this noodle is flat and thin instead of round and thin. While this tasty dish offers healthy carbohydrates, fiber, protein, vitamins and minerals, its other nutritional facts may give you pause. The saturated fat, sodium and cholesterol content in fettuccine Alfredo make this a food best eaten in moderation. A two-cup serving of one fettuccine Alfredo recipe adds 660 calories to your meal plan. If you stick to a 2,000-calorie meal plan, the calories in this pasta dish account for 33 percent of the allowable calories in a day. This may be too much for a single meal. Diet Channel contributor Michele Turcotte, M.S., RD/LDN, indicates the average meal ranges from 300 to 500 calories for women and 400 to 600 calories for men. 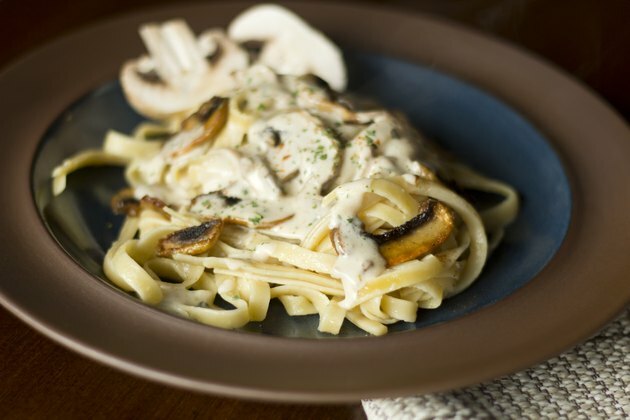 Consider eating a smaller portion of fettuccine Alfredo, or seek out a lower-calorie version. Fettuccine Alfredo is also quite high in fat. A serving has 10 grams of fat, including 3 grams of saturated fat. This eats up a portion of the Mayo Clinic's recommended limit of 15 grams of saturated fat per day. In addition being high in saturated fat, a serving of fettuccine Alfredo contains 10 mg of cholesterol. This accounts for 3.3 percent of the recommended cholesterol limit of 300 grams per day. One serving also contains 1,280 mg of sodium. The American Heart Association advises a limit of 1,500 mg of sodium per day for most people. Cholesterol and sodium can both contribute to the development of heart disease. The pasta in fettuccine Alfredo contributes 88 grams of carbohydrates per serving. This amount is a significant portion of the 225 to 325 grams you should consume daily for energy, according to the Mayo Clinic. You also take in 2 grams of fiber, a nutrient your body uses for digestive and bowel health. You can increase the fiber content of this dish by choosing whole-wheat pasta varieties. The Mayo Clinic recommends consuming 25 to 38 grams of fiber each day. Fettuccine Alfredo is a good source of protein. Each portion of this pasta dish provides 18 grams of this macronutrient, which serves as an energy source and influences muscle building and immune function. You require 46 to 56 grams of protein each day, according to the Mayo Clinic. Eat a serving of fettuccine Alfredo to significantly boost your calcium intake. One portion of this pasta dish provides 30 percent of the daily recommended intake of calcium. This primarily comes from the cheese, butter and cream common in Alfredo sauce. The calcium in fettuccine Alfredo is vital for bone strength and heart health, but keep in mind that the saturated fat and cholesterol in this dish are certainly not good for your heart. One serving of fettuccine Alfredo contains 20 percent of the iron you require each day. Iron is important for your red blood cell count. This serving also provides 12 percent of the recommended daily value of vitamin A. The vitamin A in this pasta dish protects your eyes from a variety of conditions, including blindness and infections.